Introduction the NEW KAISER 1.4 HDMI CABLE to the Cablesson HDMI range. The Kaiser HDMI Cable takes advantage of the new and improved function of the 1.4 specification, including Ethernet Channel which will allow your HD equipment to connect directly to the Internet without addition cables. Another advantage will be the Audio Return Channel. Since HDMI transmits sound through the HDMI Cable, this has been simplified by allowing your HDTV to send audio upstream for processing and playback to your AV amplifier. 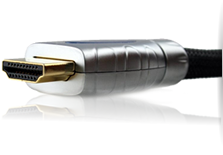 With a 24 AWG cable to ensure the best and smoothest transmission of the digital data. Future-proof yourself with HDMI 1.4.